Experience the only Daily Disposable Lens enhanced by Tangible™. What are Daily Disposable Soft Contact Lenses? Daily disposable lenses are single use lenses that are worn one time and discarded at the end of the day. A new pair of lenses is worn the next day. Daily disposable soft contact lenses are made from softer more pliable materials that conform to the shape of the eye. Soft contact lenses allow oxygen to pass through the contact lens to the cornea. Interested in SimplifEyes 1Day Daily Disposable Soft Contact Lenses? 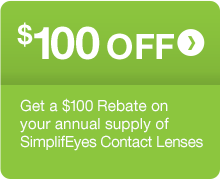 Find an eye care practitioner that is prescribing the new SimplifEyes 1Day daily disposable contact lenses. Your doctor will help you find the lens that provides the vision and comfort you are looking for.